Retail investors are pressing for stricter derivatives regulation in the financial services industry. Yet many of the same investors engage in derivatives trades that would make even an institutional structured products specialist uncomfortable. VelocityShares Daily 2x VIX Short Term ETN is an exchange-traded note issued in the USA. The Note will provide investors with a cash payment at the scheduled maturity or early redemption based on 2X the performance of the underlying index, the SP 500 VIX Short-Term Futures Index less the Investor Fee. As VIX came crashing down this year, people thought it may be a good idea to be short vol. 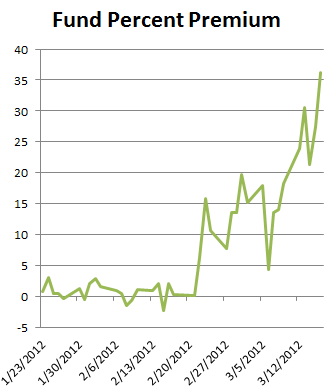 It wasn't enough just being short though - they wanted to be 2x long US equity implied vol via TVIX. As more people kept piling in, it became what's known as a "crowded trade". Some people were short the ETN and long the VIX futures against it, trying to arb out the discrepancies between TVIX price and NAV. But before the weekend, someone decided to cover their short. 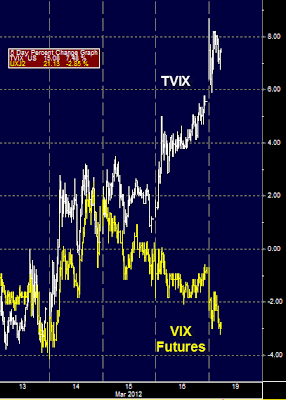 And that's when the ETN began to rally, while VIX futures went lower. This continued into today. In the last 5 days the VIX futures are down about 3%. According to the description above, TVIX should be down 2x or 6%. Yet TVIX is up over 7%. The short squeeze has pushed the price up so much that TVIX now trades at over 36% above its net asset value. It is now nearly impossible to short TVIX since there are none to borrow - thus limited ability to arbitrage out the dislocation. 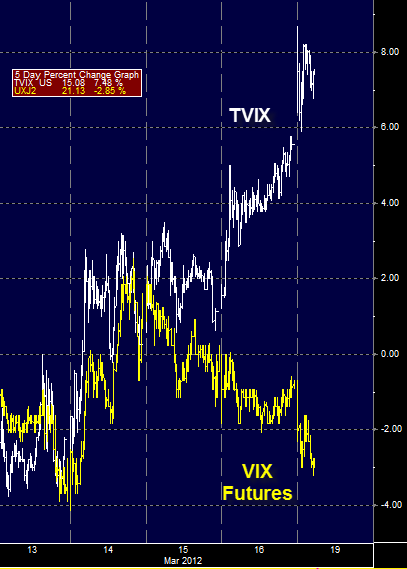 By lunch time today TVIX is up over 1% for the day, while VIX futures are down 5%. So the next time you feel like shorting some vol, try using futures directly, or stick with SPY options. This is not for the faint-hearted and the fact that it is exchange traded (vs. OTC) doesn't make it a whole lot "safer".